CEBU CITY -- AJ "Bazooka" Banal registered another spectacular knockout win after he made short work of Thai visitor Komrit Lukkuongmuekol during last night's 'Moment of Truth' boxing event at Cebu City Sports Complex here. 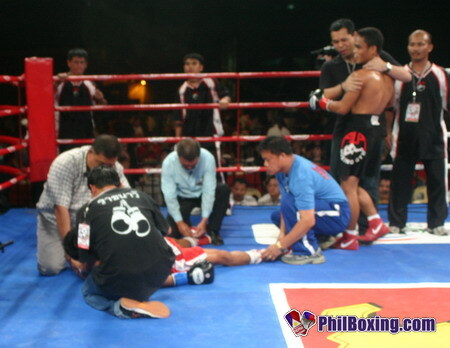 Banal (12-0-1 10 KOs), who stopped ten of his 12 victims inside the distance, disposed Komrit (15-3-0 11 KOs) in 2:11 of the first round with a vicious left that sent the Thai sprawling to the canvas and stayed their for a good few minutes after failing to beat the count. Komrit, also known as 3K Battery Eveready Gym, is himself a dangerous knockout artist having stopped 11 of his 15 victims, 8 of them Filipinos including Banal's stablemate Sherwin Paro. 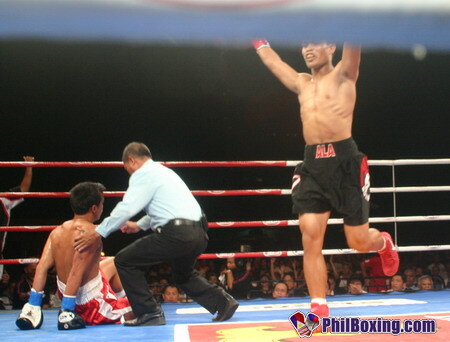 Paro, fighting Komrit on Sep. 2003, had racked 11 successive wins by then including 8 knockouts and was looked up as Cebu's fast rising prospect when he was stopped by Komrit in the 5th round. Thus 'Bazooka' Banal avenged Paro's loss and continues to blast the opposition amazingly against a very tough lineup which was thrown at his very young career. The 18-year-old Banal have now battled and disposed 5 Thais and 2 Indonesians, knocking all of them out except one. Banal (right) raises his hands in victory after Komrit failed to beat the count. Komrit is being administered by the medics as Banal looks on. 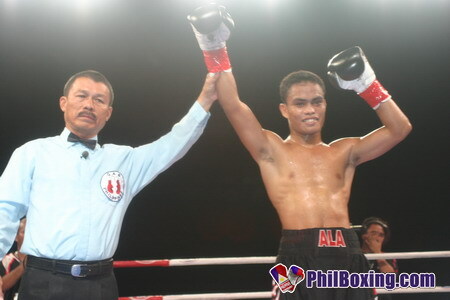 Referee Tony Pesons raises Banal's hand in victory. 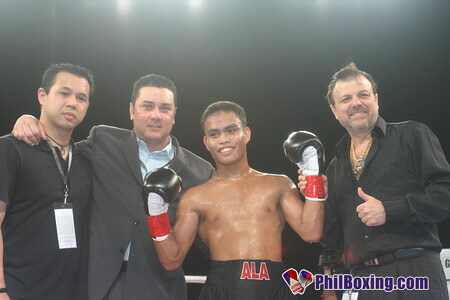 Banal (2nd from right) poses with, from left, his manager Michael Aldeguer, and GBP's Eric Gomez and Sampson Lewkowicz. Banal sports a solid defensive stance which is very hard to penetrate in addition to an awesome one-punch KO power from both hands and a highly technical boxing and counter-punching abilities. Golden Boy Promotions Vice-President Eric Gomez, watching at ringside, disclosed after the fight that he will work for Banal to fight in the undercard of the Oscar de la Hoya-Floyd Mayweather superfight on May 5 in Las Vegas. Matchmaker Sampson Lewkowicz, on the other hand, said that Banal might fight for a world title as early as this year.